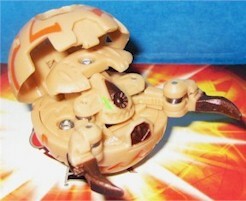 Spidaro is a spider-like Bakugan. It's Ball Form looks similar to Hakapoid's. It is an officially unreleased Baku-Closer Bakugan. His Subterra version has 900G, There is another Subterra version of him that has 700g. A Darkus Spidaro has 800g. Purchase your Spidaro Bakugan from Amazon now!